The observer pattern is a Gang of Four design pattern. This is a behavioural pattern as it defines a manner for controlling communication between classes or entities. The observer pattern is used to allow a single object, known as the subject, to publish changes to its state. Many other observer objects that depend upon the subject can subscribe to it so that they are immediately and automatically notified of any changes to the subject's state. The pattern gives loose coupling between the subject and its observers. The subject holds a collection of observers that are set only at run-time. Each observer may be of any class that inherits from a known base class or implements a common interface. The actual functionality of the observers and their use of the state data need not be known by the subject. 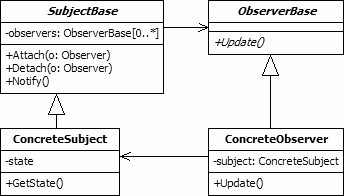 A variation upon the observer pattern is seen in the .NET framework's event model. In this model, many objects may subscribe to an event and automatically be notified when the event is triggered. The observer pattern is also used widely in user interface development, particularly with data binding functionality. An example of the pattern, which will be demonstrated in a simple form later in this article, could be used in a logging system. A central logging module could be used to receive errors, warnings and other messages from a variety of services. This would be the subject object, whose publicly visible state included details of the last message received. The logging module itself would not perform any additional processing of the messages received. Instead, it would raise a notification to its observers for each new message. The observers in this example could be varied in functionality but all would receive the same notifications. There could be an observer that formatted the last message into an email and sent this to an administrator. Another observer may store the message in the server's event log. A third could record it in a database. In each case, the subject object would be unaware of the actions being undertaken. The observers in use could be selected by a user at run-time or via a configuration system to allow control of the logger's behaviour without modification to the source code. SubjectBase. This is the abstract base class for concrete subjects. It contains a private collection of the observers that are subscribed to a subject and methods to allow new subscriptions to be added and existing ones to be removed. It also includes a method that can be called by concrete subjects to notify their observers of state changes. This Notify method loops through all of the registered observers, calling their Update methods. ConcreteSubject. Each concrete subject maintains its own state. When a change is made to that state, the object calls the base class's Notify method to indicate this to all of its observers. As the functionality of the observers is unknown, the concrete subjects also provide the means for the observers to read the updated state, in this case via a GetState method. ObserverBase. This is the abstract base class for all observers. It defines a method to be called when the subject's state changes. In many cases this Update method will be abstract, in which case you may decide to implement the base class as an interface instead. ConcreteObserver. The concrete observer objects are the subscribers that react to changes in the subject's state. When the Update method for an observer is called, it examines the subject to determine which information has changed. It can then take appropriate action. The following shows the basic code of the observer design pattern implemented using C#. This code is compatible with version 1.1 of the .NET framework. For newer versions, you would generally replace the use of ArrayList with a generic collection. The example includes an extra method to that in the UML diagram, named "SetState". This permits the state to be changed and calls the Notify method accordingly.